Holly, MI – Should Holly allow medical marijuana businesses? That’s a topic currently being discussed both in Holly Township and in the Village of Holly following recent changes to state law that give communities the chance to allow different types of businesses related to the medical marijuana industry. The law allows five different types of businesses, and communities could decide to allow all, some or none of the choice: growers, manufactures/processors, distributors/dispensaries, transportation and testing facilities. 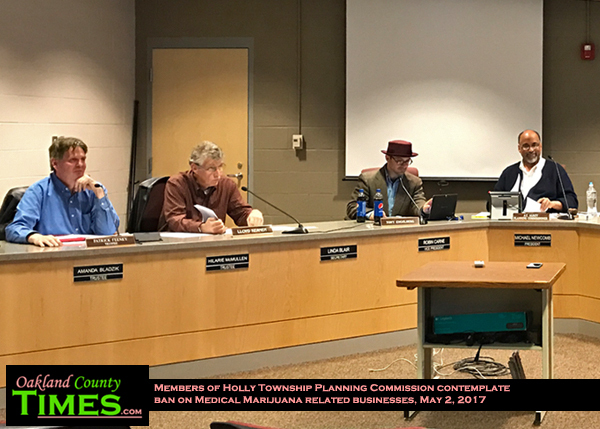 The Holly Township Planning Commission met Tuesday evening to discuss an ordinance that would prohibit all types, ultimately making the recommendation that a ban be adopted. The ban only affects commercial businesses – not individuals and caregivers who currently grow or consume in their homes. The commission voted unanimously to recommend the ban, which will be considered by the Township Board at a future meeting, possibly May 17. The Village of Holly is considering multiple sides of the issue, with a work study session planned for June 13 at 7pm. “When the old law was ruled not valid and the new law was introduced we rescinded our prior zoning ordinance that allowed dispensaries in certain areas. We have scheduled a study session on June 13th at which time ROWE Professional Services will provide an overview of the new law. We also expect to have some public comment from the community as well as some cannabis support advocates,” said Village Supervisor Jerry Walker. In 2013 Holly’s only dispensary, Well Greens, was raided by Oakland County Narcotics Enforcement Team and subsequently closed.